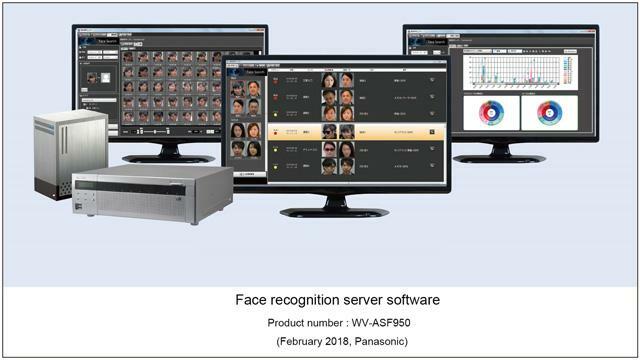 Osaka, Japan - Panasonic Corporation today announced that it will release face recognition server software using deep learning technology in July 2018 outside Japan and in August 2018 in Japan. Featuring a core engine that boasts the world's highest face recognition performance*1, this high-precision face recognition software can identify faces that are difficult to recognize with conventional technologies, including faces at an angle of up to 45 degrees to the left or right or 30 degrees up or down, and those partially hidden by sunglasses. In Addition, the new software features the "iA (intelligent Auto) mode"*2 that automatically adjusts settings for the camera to shoot optimal images best suited for face recognition. When it is used with Panasonic's i-PRO EXTREME series network cameras installed with the "Best Shot License Key" that comes bundled with the software, only the "Best Shots" will be sent to the server for face recognition. The combination of Panasonic core devices and the face recognition software maximizes the performance of the software's core engine to achieve high-precision recognition. The company plans to add a function to recognize partially covered faces with a surgical mask, which is difficult with conventional systems, by the end of this year. Panasonic will continue to improve its security-related products and provide various solutions to meet increasingly diversifying and evolving customer needs, such as face recognition solutions for integrated management with a monitoring system. By providing these solutions, the company is aiming to become a "total integrator" capable of contributing to customers' frontline operations. *1 In April 2017, the product achieved the highest level of face recognition performance in the world in a comparison test (IJB-A Face Verification Challenge Performance Report/IJB -A Face Identification Challenge Performance Report) of NIST (National Institute of Standards and Technology) of the United States, one of the most authoritative institutes in the world. - Using Panasonic's system that combines this product with cameras that include the iA function allows faces to be detected by the camera and only the Best Shot images that contain faces to be sent to the server, which dramatically decreases network load and eliminates the need for large bandwidth. Performing facial recognition on the server using the Best Shot images reduces server load and hard drive capacity requirements as well as permitting up to 20*5 network cameras to be connected to a single server. - When using Panasonic's system with 10 or more network cameras connected, costs can be reduced by about 40 to 50% compared to conventional systems that do not use the Best Shot function. 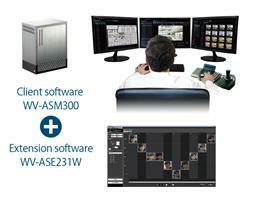 Face detection, face recognition, and tracking with recorded video can be performed in the same GUI by performing integrated management with the WV-ASM300 or WV-ASE231W client software for Panasonic i-PRO monitoring systems. This eliminates the need for the dedicated operation and management required for conventional face recognition systems and enables work to be centralized. Number of faces: Up to 10,000 faces can be registered. This number can be expanded to a maximum of 30,000 faces by using the Face Registration Expansion Kit.